I’ve always thought in the broad scope of things that trout fishing calls for more complex decision making over saltwater fly fishing in terms of what goes into choosing the fly patterns we fish. I think a lot of that comes from the simple fact that conditions can change on an hourly basis on our trout streams and also that there’s hundreds of species of aquatic insects found on many of the trout waters we fly fish. However, the more I fly fish in the saltwater, the more I’ve come to understand how inaccurate this past notion of mine is. 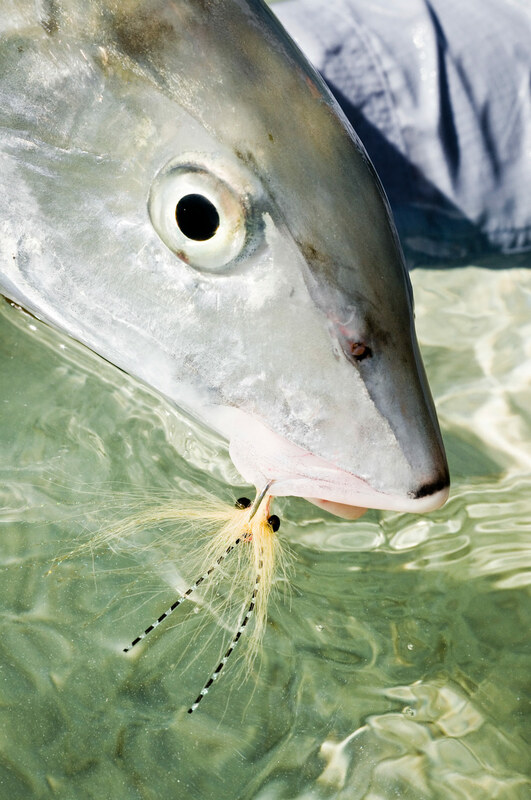 In many cases, fly pattern choice is just as important in saltwater fishing as it is in freshwater fishing. And If you want to maximize your success fly fishing in saltwater, you need to pay close attention to your surroundings and the ecosystem your fishing, just like you do on your trout water. On a recent bonefishing trip to Andros South Lodge in the Bahamas, I found out first hand, that there’s times when even a perfect presentation and retrieve won’t always get the job done. Sometimes, even an opportunistic bonefish in the bahamas will quickly shun a fly if it doesn’t look and match close enough to the forage food found in that location. Of all the traits of a fly (color, size, shape, behavior), color seemed to rank the highest of all the traits in whether a bonefish decided to eat my fly or not. Louis, explained to me that it’s very important to match the color of your fly pattern to the color of the bottom you’re fly fishing. Many species of food that bonefish prey on have the ability to change colors to match their surroundings. Take, for example, the shrimp. If a shrimp happens to find itself on a dark bottomed flat, its body will turn darker to match its surrounding color scheme, and if that same shrimp happens to swim onto a sandy white bottom flat, it will quickly lighten its body color, even become transparent at times. It’s how shrimp and many of the other forage foods on the flats keep themselves camouflaged to stay off the radar and be eaten by predators. It’s very important when bonefishing to always do your best to match your fly pattern color to the bottom of the flat your fishing. Take this into account next time your bonefishing or just saltwater flats fishing in general. Choose light colored flies when fly fishing light bottomed flats and darker colored fly patterns for dark bottomed flats. It’s not rocket science, but sometimes we tend to overlook the little things like fly color when we’re so focused on trying to make that 75 foot backcast into the wind. 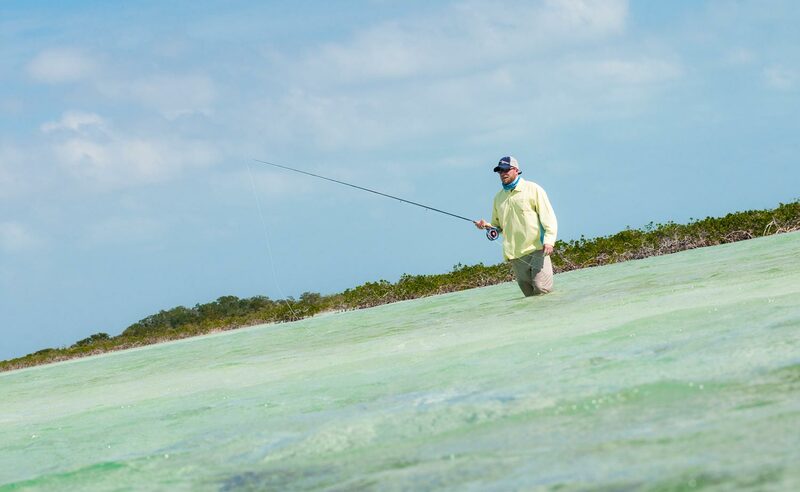 This entry was posted in Saltwater Fly Fishing and tagged Andros South Lodge, bahamas, Bahamas Bonefishing, bahamas fly fishing, bonefish fly patterns, bonfishing tips, fly fishing blog, Fly Fishing for Bonefish, fly fishing the flats, Gink & Gasoline, Gink and Gasoline, how to flats fish, Kent Klewein, Louis Cahill, Matching Fly Color to the Flat Your Fly Fishing, Saltwater Fly Fishing by Kent Klewein. Bookmark the permalink. Appreciate the good advice on fly selection Kent, but don’t throw out the old pink or white Gotcha’s and Charlie’s with plenty of flash tied in. On a recent flats excursion with a long-time fishing buddy, we were getting constant refusals. He’s an excellent fly-tier and I’m mediocre and as our bonefishing skills have developed, we’ve become more sophisticated in our fly selections, using many of the more realistic “buggy-looking” patterns. We were fishing a flat where there’s lots of mantis shrimp and we showed the bones several good looking flies to match the prey they were foraging on and the marley bottom, and all were summarily snubbed. Trying to decide what to try next, I remembered catching fish here back when first getting into bonefishing. I recalled that all my fly box contained then was a selection of Charlie-type patterns, so I tied on a bright pink Gotcha and first cast, “Fish On Finally!” We caught fish the rest of the afternoon on our old fashioned pink Gotcha’s. Have no idea why this fly worked when obvious better patterns were snubbed. Maybe for the same reason a parachute adams works so well sometimes. I agree 100% and had a couple situations during the trip exactly like yours. Keep those chart/white clousers as well 🙂 They proved hot the entire trip. Thanks for your feedback and tips. I just wanted to bring up in the post how matching bottom and fly color helped us get into bones when they were following but not eating. John, i look forward to bonefishing with you in the future. With all the time you have spent on the flats lately, I know I could learn a great deal from you.